Śródmieście – the Central Quarter was created mainly Prussian rulership. Firstly, the former outskirts were organised and developed, and later the quarter was developed and supplemented in the post-war period, continuing to contemporary times. This process has given Śródmieście – the Central Quarter its present form. Walking around this part of the city you will find there are at least several significant places worth visiting. Going west from the Old Market several minutes is enough to reach the indicated square, known for over 200 years as the Wilhelm Platz, and today as Plac Wolności or the Freedom Square. On one side of the square you will notice a magnificent classicist facade of the Raczyński Library, the first public library in Poland. Opposite the library is the National Museum, currently home to collections of European sculpture and painting (though the building was originally intended to exhibit Prussian works of art). The museum’s prized possession is the largest 17th century Spanish painting collection in Poland as well as the only painting on display in Poland by Claude Monet. The museum’s new wing is home to paintings by Polish artists with the largest artwork collection of Jacek Malczewski. Going south from the museum you will stumble upon the imposing Bazaar – in the second part of the XIX century it was a hotel connected with a commercial section, simultaneously serving as the most important patriotic centre of those times. It is historically famous for the visits and the inflammatory speech of Ignacy Paderewski, delivered in the late afternoon of the 27th of December 1918 to citizens of Poznan of Polish descent assembled on the square. In honour of the victory of the Wielkopolska Uprising, the square was given its current name – Plac Wolności – Freedom Square. Going further to the west, we reach the Teatr Polski, the design of a distinguished Poznan citizen – Zygmunt Gorgolewski, who later became famous for designing the Lwów (now Lviv) Opera. The Teatr Polski theatre building is well known, among other reasons, for the two words proudly sitting on the facade „Naród sobie" – “A Nation unto itself”. Actually at the time of its construction, Poles living in all occupation zones, the Austrian, Prussian and Russian partitions, sent money to build the only public institution in Poznań, in which one might legally listen to Polish being spoken near the end of the XIX century. In the next few years an interactive museum of the Wiekopolska Uprising is going to be built right next to it. Not far from the theatre one can see the Okrąglak building, which received its name from its circular shape, it is an excellent orientation point in this part of the city. Built in the mid XXth century as a state retail centre, it has now become an office block. It has a remarkable staircase, which occupies over 40% of the building surface area! It is regarded as an outstanding example of Polish architectural modernism and despite its relative lack of age; it is already an architectural monument! Going further down along Mielżyńskiego Street, one comes across a tenement building with a characteristic wood décor on the roof. During the German occupation there was a restaurant here, where waiters connected to the Polish Underground State (the Dr Witaszka Organisation), poisoned the meals served to German officers. Several buildings further is an inconspicuous tenement building with a climatic courtyard – indeed this where for over two centuries the members of the Poznań Society of Friends of Science met, and which during times of the partitions served as an informal higher academy, and today is a meeting place for scientists and supporters of science. Walking even further down Mielżyńskiego Street, we reach Cyryl Ratajski Square, which in Prussian times was known as Nowomiejski (New City) Square. The XIX century buildings were almost entirely destroyed during military activities, today the square is considered to be a good example of socialist realism architecture. Going up Mielżyńskiego Street, we reach Święty Marcin Street – the main artery of the city centre, and the only street in Poland that celebrates the day of its Patron Saint! Its former buildings have mostly disappeared during the liberation of the city and post-war rebuilding. There are now only a few Secession – Art Nouveau tenement buildings which can be found among the office blocks from the 1970's. At the western end of the street you will find the Imperial Quarter – Dzielnica Cesarska. To the south, Taczaka Street runs parallel to Święty Marcin Street and with much better preserved XIX century architecture, which recently has recovered its lustre and popularity. This due to both the increasing number of newly renovated tenement buildings, but also due to the pubs and clubs, somewhat different from those on the Stary Rynek – Old Market. In the next few years the Polish Dance Theatre, to whom Poznan has been long host to, is going relocate here. A short distance from Taczaka street, a 5 to 10 minute walk, we can find the famous Stary Browar – Old Brewery – art and business centre. The buildings of the former brewery have been matched with stylized buildings and park. Inside the Old Brewery, we will find a countless number of shops, art galleries and event-exhibition halls, offices, contemporary art installations, restaurants, music clubs, a five-star hotel as well as a cinema. This retail centre, with its own individual style and character, has for 10 years won a series of awards and won the hearts of even those who do not like shopping. 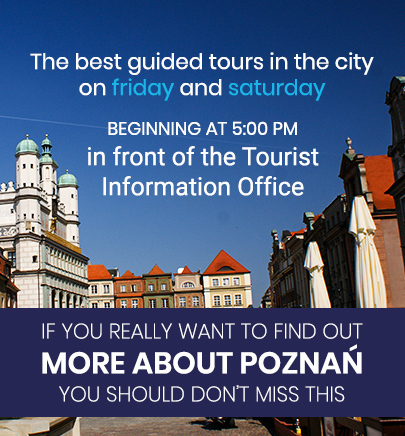 It is still the most celebrated retail centre in Poland and the collection of its trophies include the title of the Best retail centre in the World to be visited with a tour guide. If anyone would like to do some shopping outside of the retail centre, it is worth taking a walk along Półwiejska Street – the longest street in the city designated only for pedestrians and simultaneously a commercial street linking Old Brewery with the Old Market. At the junction of Półwiejska Street with Strzelecka Street, one comes across the Stary Marych monument, a sculpture of an agreeable gentleman pushing a bicycle with a briefcase hanging from the bicycle’s handlebars, a memorial in honor of the Poznań dialect. If anyone is interested in XIXth century architecture, it is worth walking around Kwiatowa, Rybaki, Strzelecką or Kopernika Streets in the vicinity, in order to take in the delightful sight of recently individually restored tenement buildings, find a cult, quaint and very old cinema in Poznań, view a delightful fountain surrounded with greenery. If you are visiting Poznan during Christmas time you need to find the time to drop by the St Francis Seraphic's Church located by the Bernardynski square, where you will see the largest live nativity scene in Europe. If you are interested in eating healthy the Sunday Green Market at Bernardynski Marketplace is your attraction.